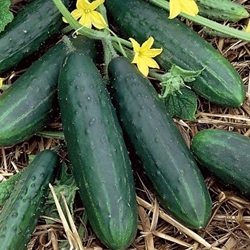 Cucumbers are a tender warm season crop. Plant after last frost date. Trellises are recommended to improve plant and fruit quality. Available in a four pack. All transplants are certified organic. Select here for transplant information, pick up and order dates. Parthenocarpic plants produce fruit under stress or without pollinators. Compact vines climb trellises easily and the small leaves allow for easier fruit visibility for harvesting. Fruit is smooth and tapered with white spines. This plant produces dark green fruit 8-9 inches long. Multiple disease resistance will keep this cultivar producing fruit throughout the harvesting season.